Fangorn Forest lies next to Isengard where Saruman the White resides. In the The Two Towers he meets with Meriadoc Brandybuck and Peregrin Took, two Hobbits of the Shire known also as Merry and Pippin. Treebeard is known to have a strong hatred of Orcs, and, after Saruman’s betrayal of the Ents, of Saruman as well. Spirits were sent by Eru Ilúvatar to inhabit the trees, which the Vala Yavanna had created along with other plants or olvar. The Vala longed for their protection since Morgoth or Melkor was destroying the trees and olvars, which could not defend themselves from him. The Ents were created by Ilúvatar at the behest of Yavanna as the Shepherds of the Forest or Tree-herders. Entwives were also created for the Ents, but, in the Second Age, were driven out by Sauron. 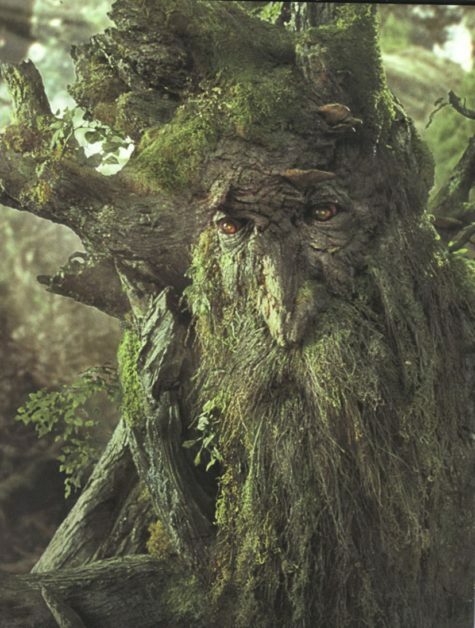 Treebeard is the oldest of three remaining original Ents. He is said to have once roamed all of the forests in Middle-earth, which included the Misty Mountains, Mirkwood, and the Blue Mountains. After the loss of the Entwives by the end of the Third Age, he and the remaining Ents dwelt in the Forest of Fangorn. This led the remaining Ents into isolation and all information from the outside world was cut off. The arrival of Merry and Pippin shifted Treebeard’s attention to take action against Saruman for hacking down his trees. He led the Ents to war against Saruman and his Orcs. Treebeard later realised that while Saruman had learned much from him, the Wizard had shared no useful information of his own. Treebeard had been friends with Saruman. It is described in The Two Towers that Saruman travelled with Treebeard and had talked with him on various subjects of concern. Saruman gathered information from Treebeard about the Forest of Fangorn; its inter-twinning paths were of particular concern to him. Saruman later abandoned Treebeard, choosing to stay in Isengard and build an army for Sauron. After Merry and Pippin’s meeting with Treebeard, Treebeard called a meeting of the Entmoot — which lasted three days — who then decided to call an attack on Isengard and Saruman. Since Leaflock and Skinbark were the oldest of the Ents along with Treebeard, they refused to fight, however, Treebeard thought he was going to his doom during “the last march of the Ents.” Treebeard hoped that some of the younger Ents would come instead of just the two, and, during the night he spread the word. They later launched an assault on Isengard. In the Years of the Trees where the Ents were thriving in 1495 Morgoth had re-established his realm in Middle-earth. With this the Entwives had moved across to the east where Anduin lay. Treebeard’s Entwife Fimbrethil was driven from her land and the two were separated forever. This may have been the dominant cause of the loss of the Entwives and the loss of the Entings. The Elven-realm Lothlórien was situated near the North of Fangorn Forest and Treebeard had met the Lord and Lady of the Galadhrim of Lothlórien, who refer to him as “Eldest”. This marked the time the Ents and the Elves would be separate. Treebeard had in addition met Galadriel and Celeborn. Over time the Ents and the Elves separated and the Elves had nothing more to do with the business of Ents. Who Is Radagast The Brown?